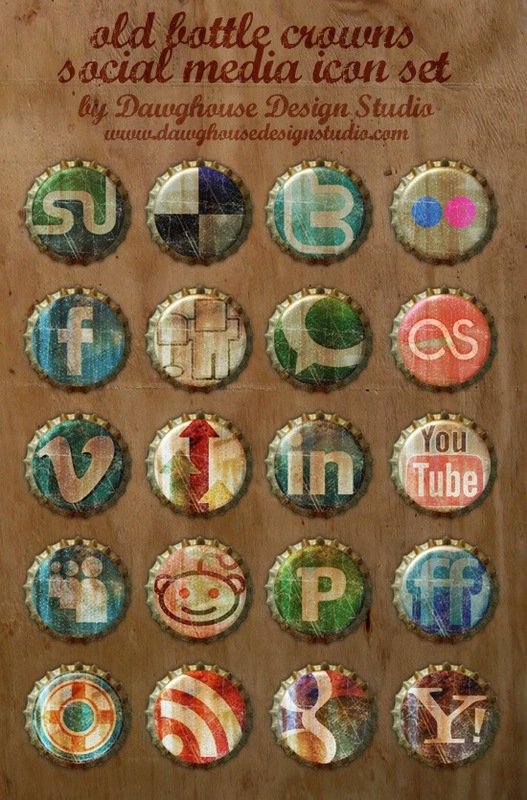 We present to you a free icon set consisting of 20 social media icons such as Digg, Stumble Upon, Delicious, and Twitter called Old Bottle Crowns Icon Set created by Dawghouse Design Studio for you Six Revisions readers. When making site edits and performing other website maintenance, you can keep small things in mind such as updating your social media icons to stand out a little more by using designs such as this one. With these buttons, you can also track performance metrics such as the number of clicks to your social media pages. Here is a full preview of each icon contained in the set. Grab the Old Bottle Crowns Icon Set as a ZIP archive below. The above works featured here are licensed under the Creative Commons license and can be used for personal and/or commercial purposes. One thing to remember is the design of your website when choosing what social media icon set to use. For example, a college’s website probably isn’t best for this icon because it wouldn’t fit the design or theme of the site. But for a restaurant or bar, this icon may be just what they’re looking for. Keep the design of your website in the back of your mind when you are choosing icon sets. Make sure they fit on your site. Jan Cavan is a Designer, Front End Developer and Illustrator, whose work has been featured in various online publications, books and magazines worldwide. She runs Dawghouse Design Studio, which is also a design blog providing tutorials, freebies and inspiration for the design community. Connect with her on Twitter, Facebook, and Dribbble.